• Authentic U.S. Presidential $1 & Statehood Quarters. • Coins come displayed on a die-cut display. • Coins come in a 4” x 6” acrylic airtight case. This “BARACK OBAMA – RENEWING AMERICA’S PROMISE” 3-Coin Set is a treasured collectible. 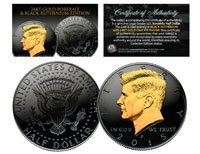 Each genuine legal tender U.S. coin has been layered in genuine 24 Karat Gold, and then colorized on the obverse with beautiful images of President Barack Obama. The 3-coin set includes: a “BARACK OBAMA - ELECTED NOVEMBER 4, 2009” Hawaii 2008 State Quarter U.S. coin, a “BARACK OBAMA - INAUGURATION JANUARY 20, 2009” Washington D.C. 2009 Quarter U.S. coin, and a “BARACK OBAMA - 44th PRESIDENT OF THE UNITED STATES” Inaugural George Washington 2007 Presidential $1 U.S. coin. Colorizing coins involves the unique application of special inks directly to the surface of a coin that achieves a level of detail, color saturation, and durability that is #1 in the industry. The result is an everlasting colorized coin collectible of ultra-high quality. The 3-Coin Set comes displayed on a die-cut display with beautiful artwork sealed in acrylic airtight case.